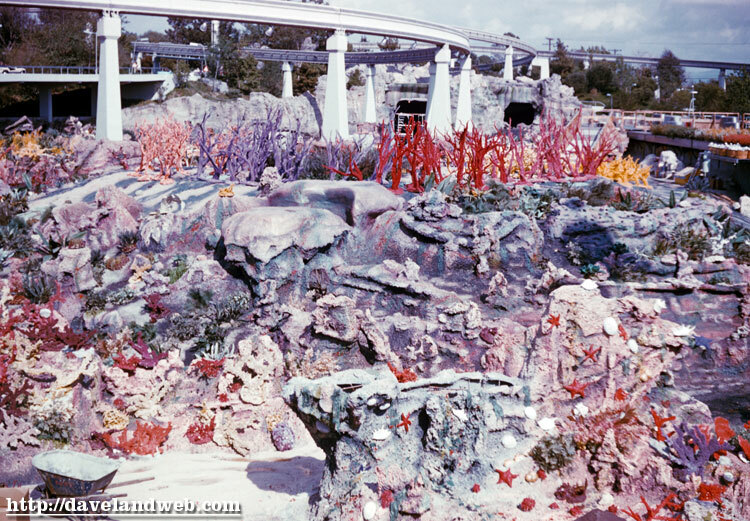 If I didn’t know that these were vintage slides, I would think that I was viewing the Submarine Voyage as it looked a few weeks ago: completely drained with a plethora of technicolor coral specimens. 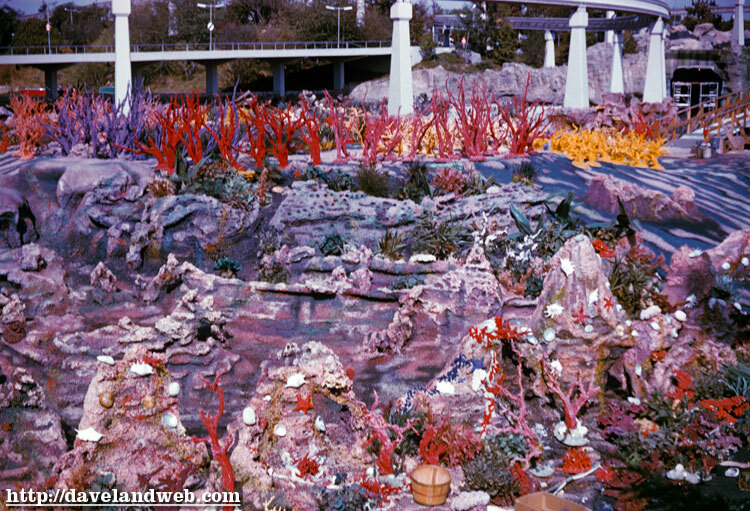 However, these first 2 slides are from March 1964 (back when the subs were gray, not Nemo-Yellow). 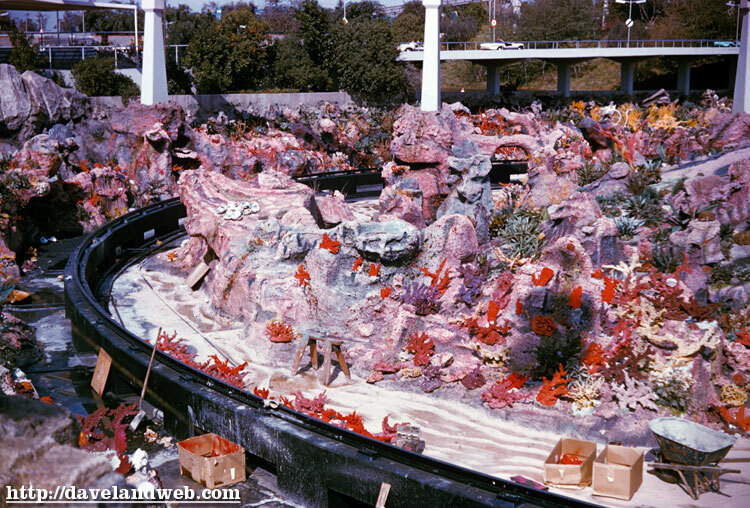 The last 4 are from an undated batch, but I would assume they are from the same March 1964 era (unless this attraction was drained and rehabbed frequently). 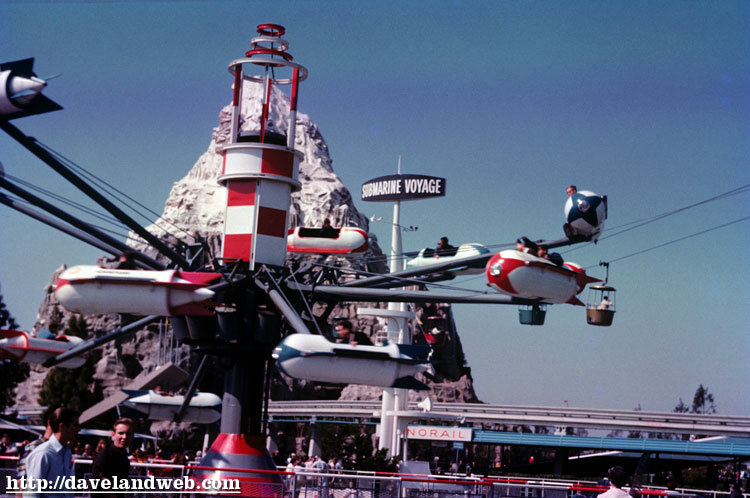 For more vintage & current Disneyland Submarine Voyage photos, visit my regular website. 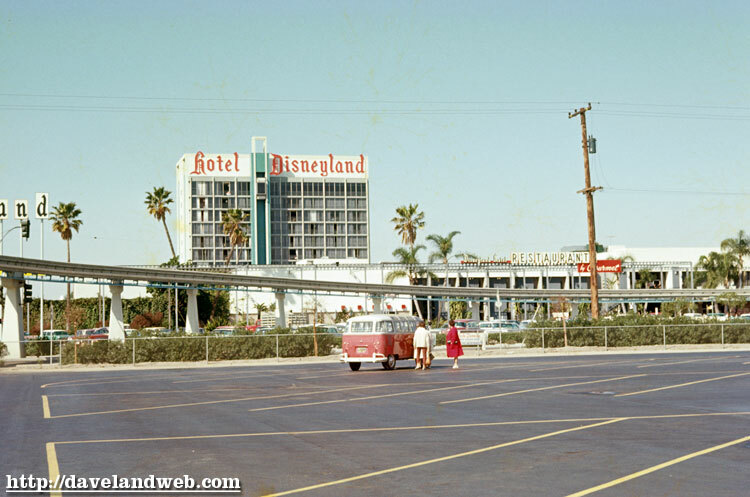 Here are a few from March 1964, starting off with a parking lot shot that includes the Disneyland Hotel and a portion of the DLand Sign. 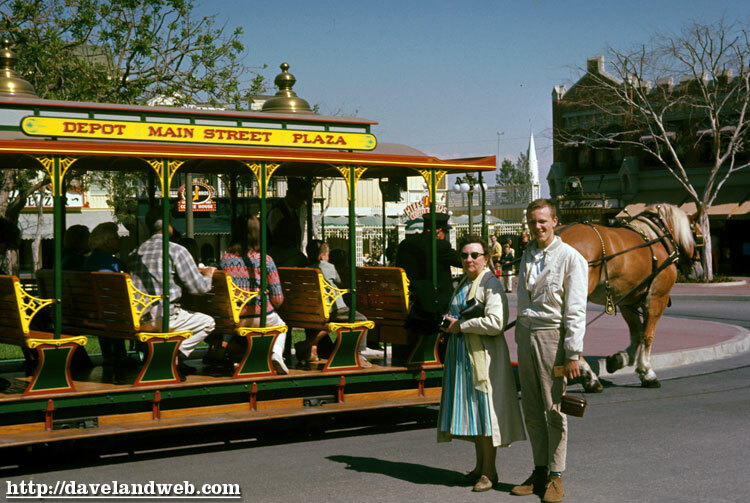 Shot two shows good ol’ Town Square with the Douglas Moonliner peeping out from behind (hey Matt, does that Horse-Drawn Trolley make you want to drive to the park today?). 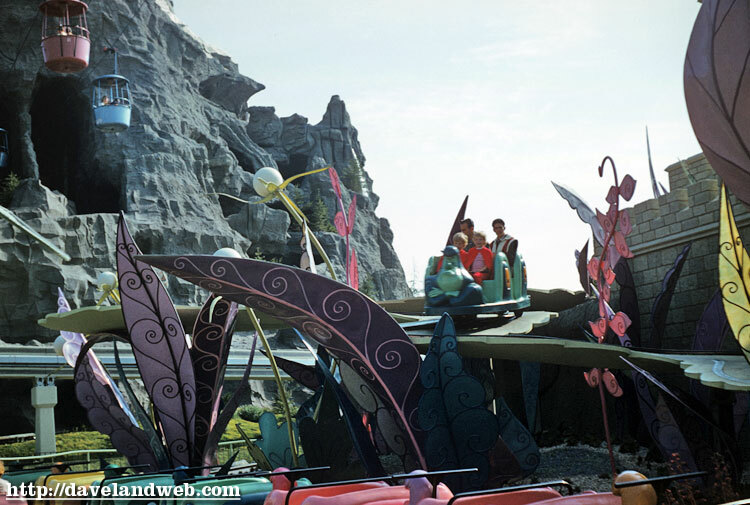 The last shot for today is a Tomorrowland view featuring the Astro Jets swirling around at breakneck speed! 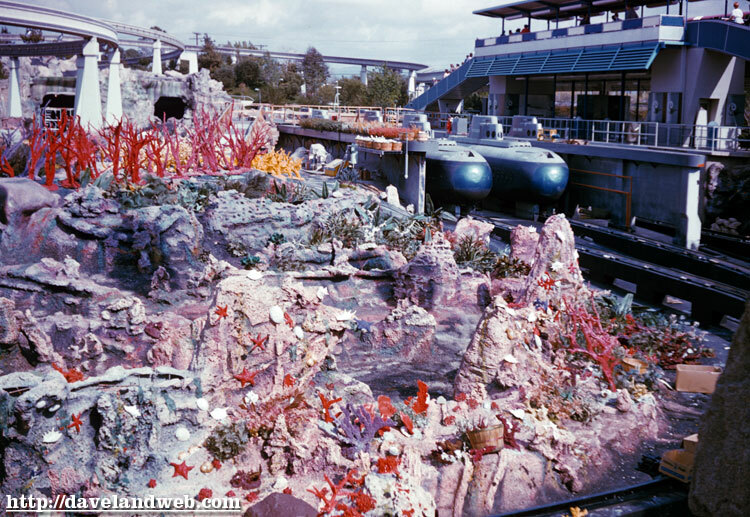 Stay tuned for tomorrow’s post featuring rehab pics of the Submarine Voyage...circa 1964. 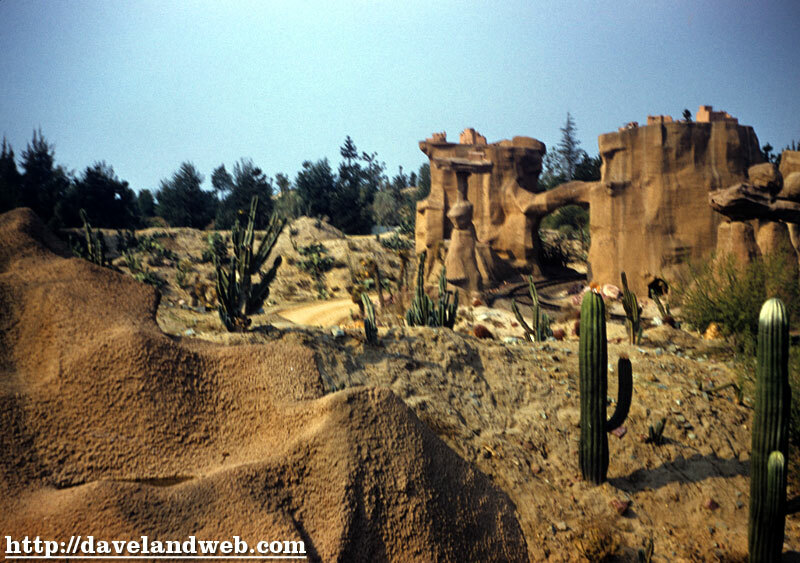 See more Daveland vintage & current Disneyland photos at my main website. Here’s another shot from the Dog Show that I featured over a month ago and that was also on the Gorilla Blog and Matterhorn Blog. 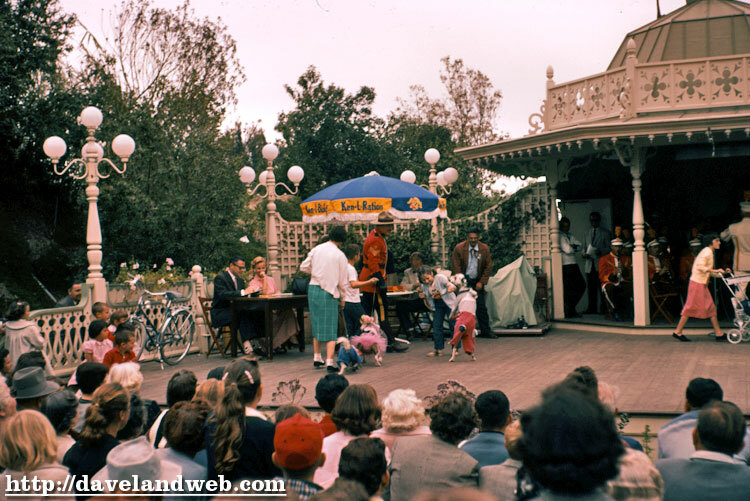 Looks like Sergeant Preston in this one which shows the old Bandstand in Magnolia Park. 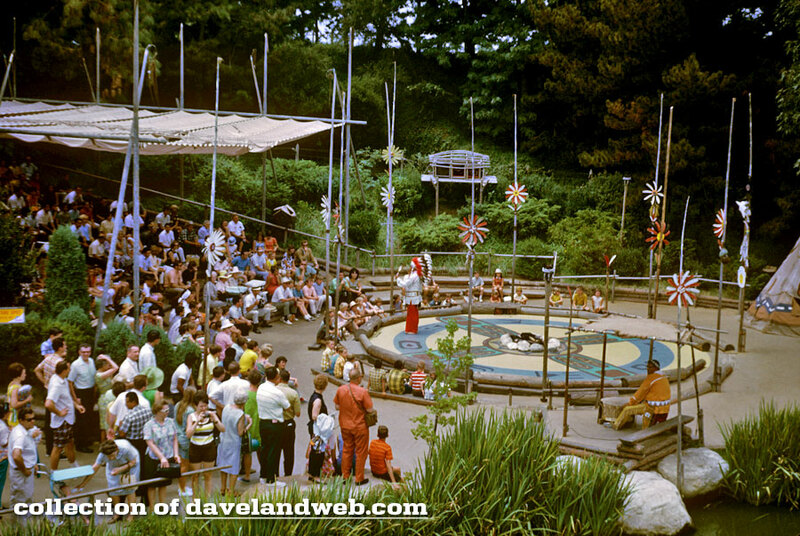 For more Magnolia Park photos, visit my regular website. 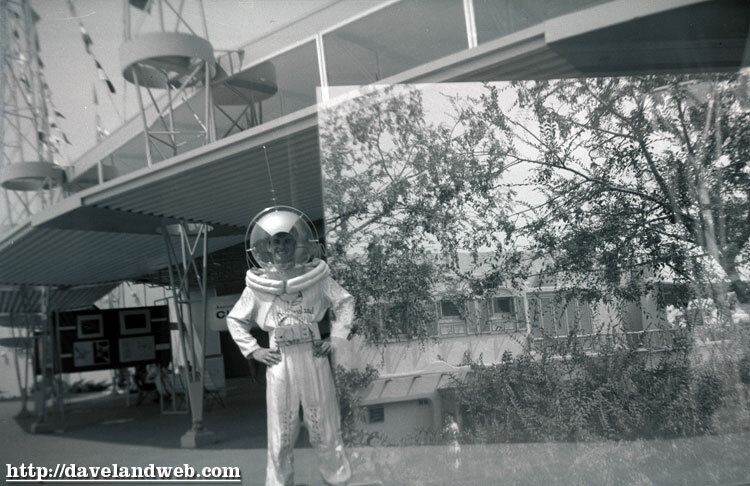 Here’s our favorite Spaceman in Tomorrowland (undated photo), standing near the Circarama. On the right appears to be some kind of double exposure/developing mistake. 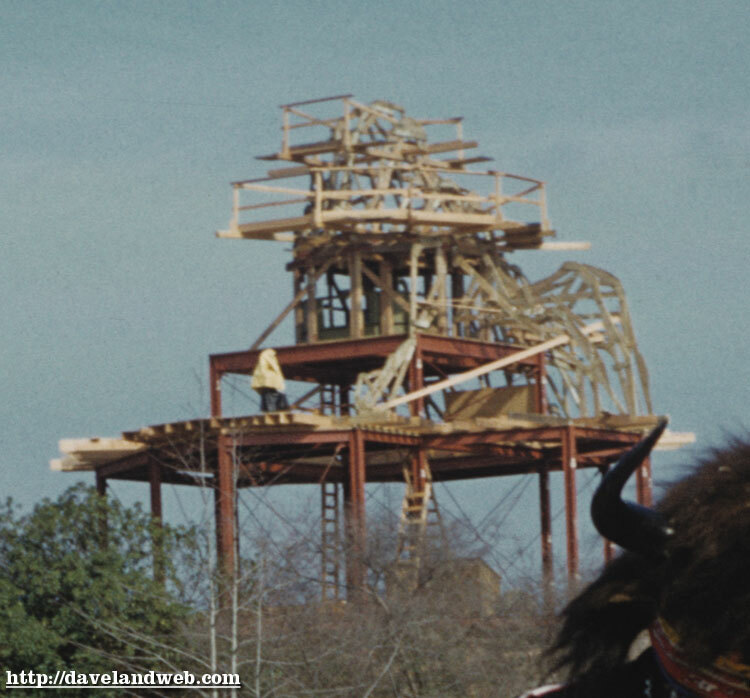 Not sure what the building is, but looks like if it is Disneyland that it could be in Adventureland. 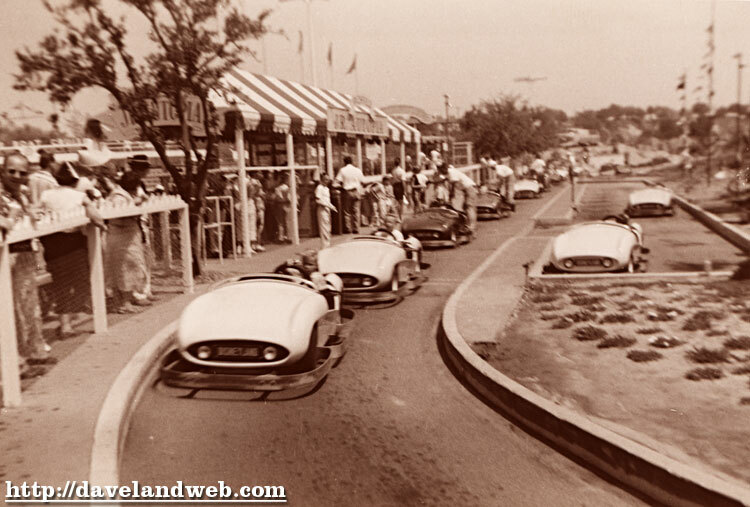 Any ideas?Picture two shows the Junior Autopia, formerly located over in Fantasyland. 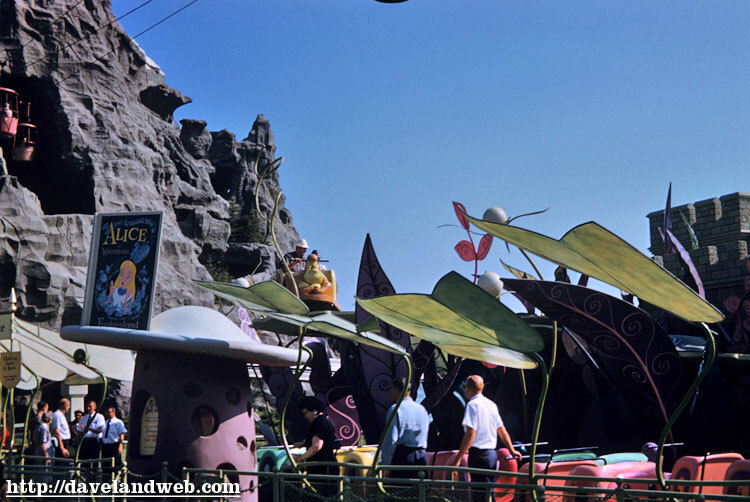 For more vintage & current Disneyland Tomorrowland photos, visit my regular website. 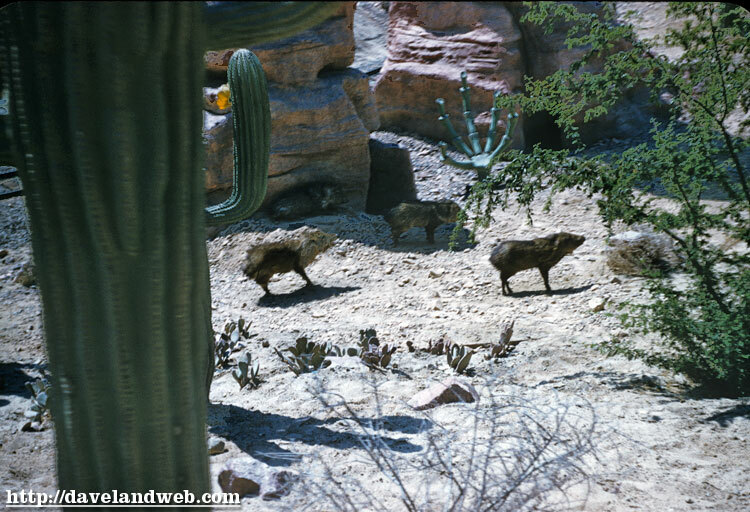 Yup, it’s another day out in the desert, folks. 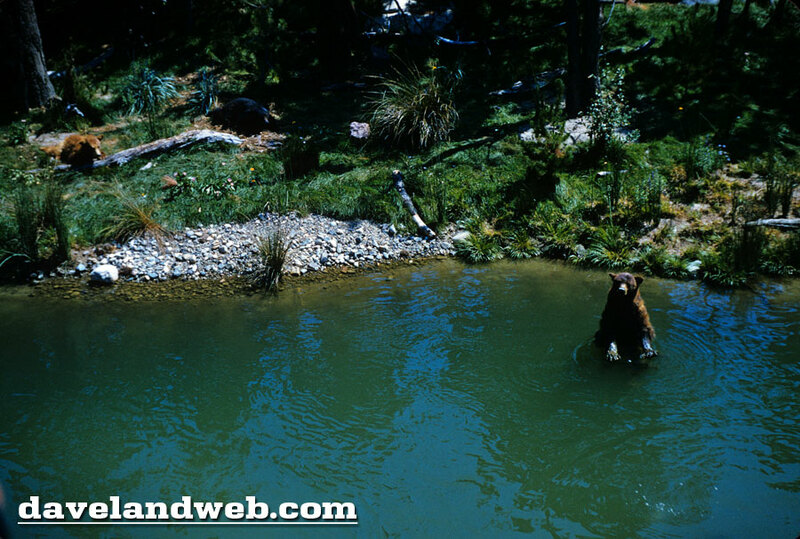 Here are more from my estimated 1965 batch of slides. 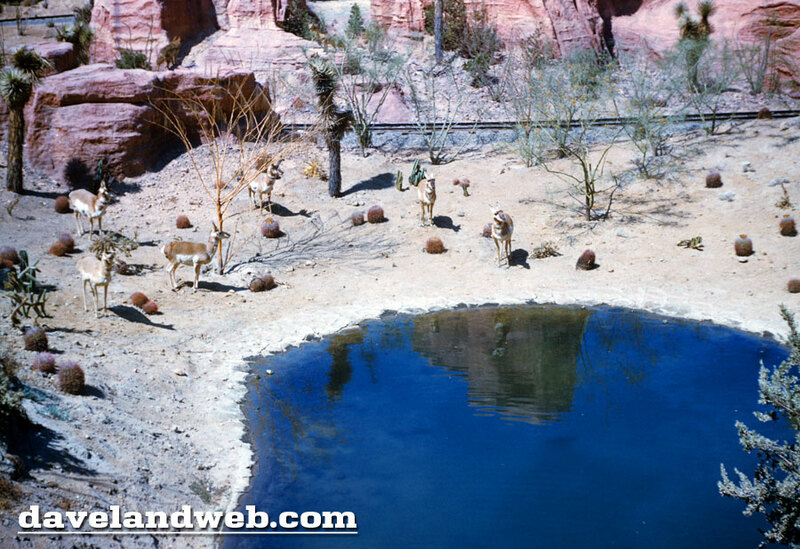 I’ll finish up this series with a little Pack Mule action in Rainbow Ridge. 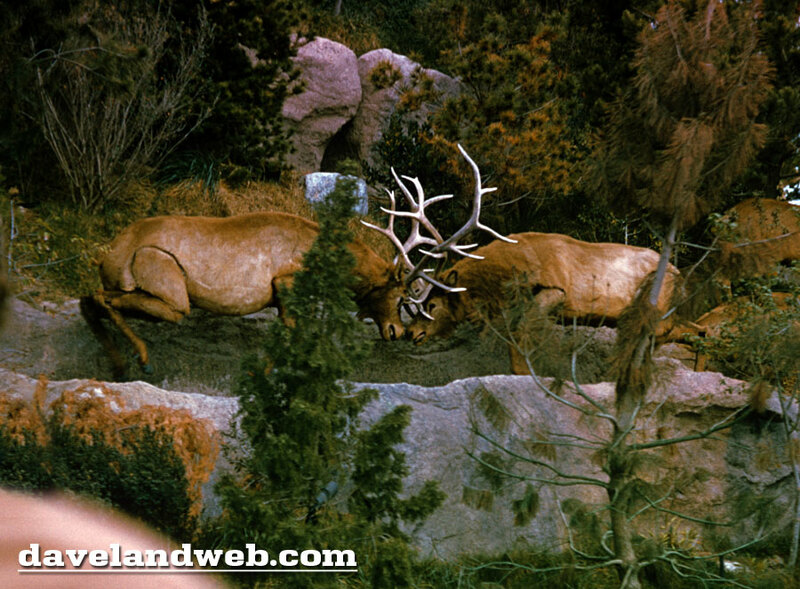 For more vintage & current Disneyland Nature’s Wonderland photos, visit my regular website. 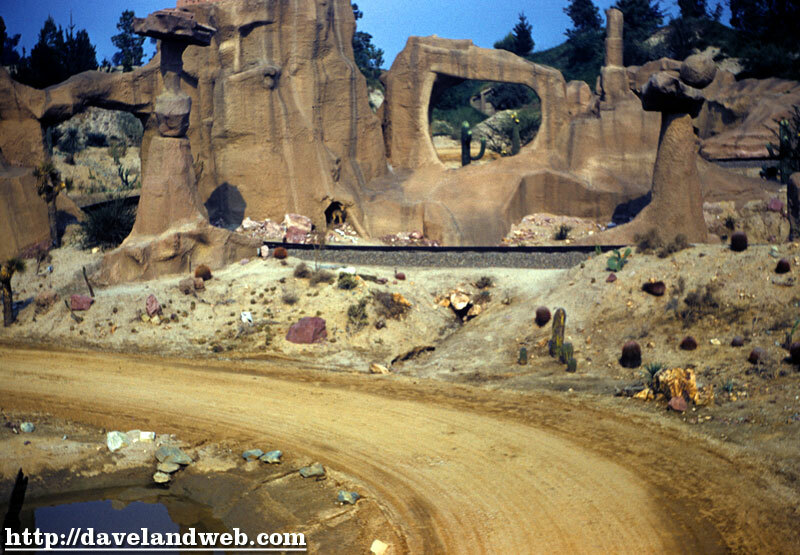 For those of you not into the Nature’s Wonderland/Mine Train attraction, you might want to just come back in a few days. 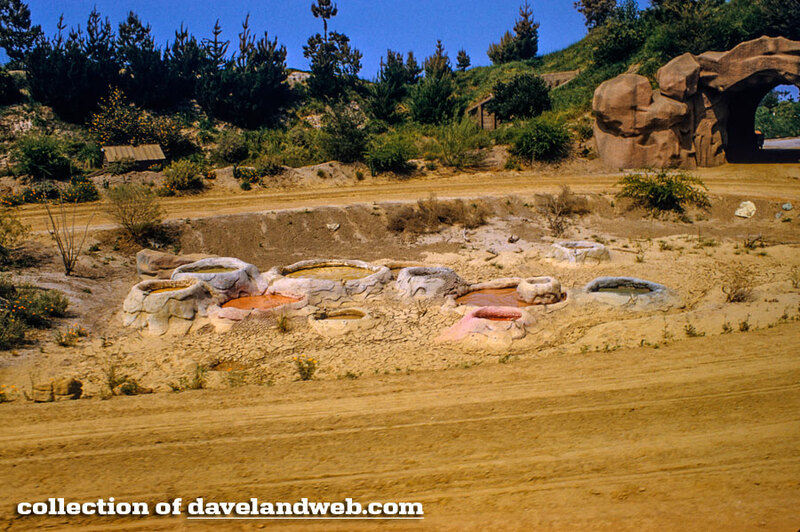 Today starts off with one more from the May 1958 batch, showing the Devil’s Paint Pots area of the attraction. 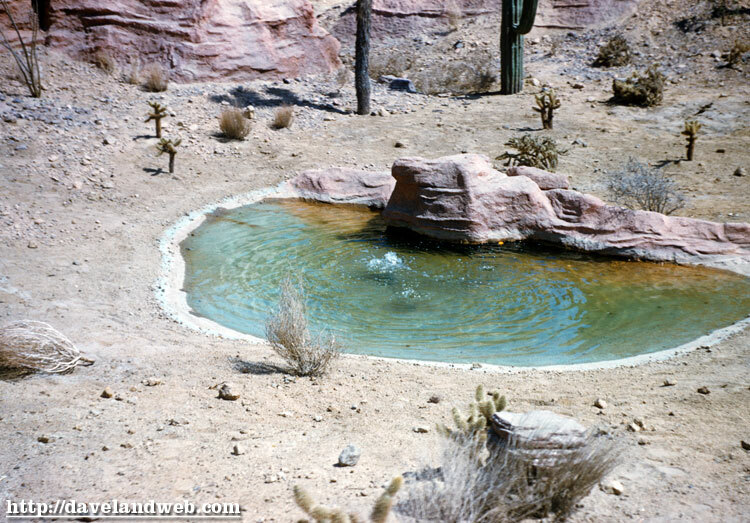 Next up are a few from an undated batch, most likely about 1965. 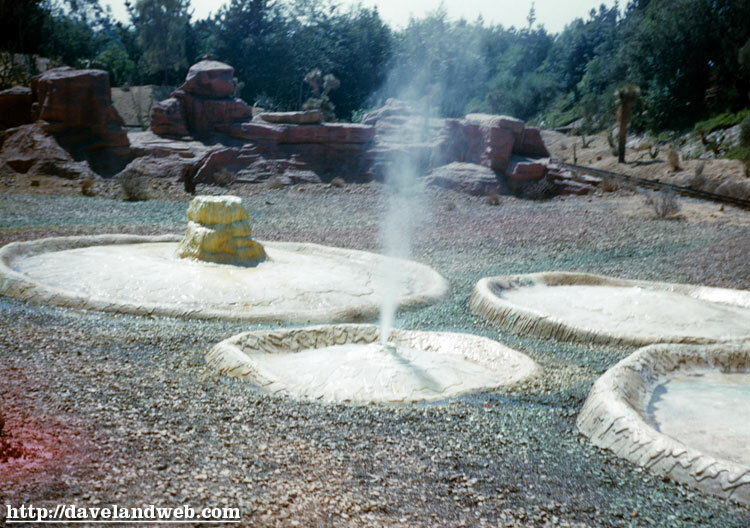 This attraction is probably one of the top ones on the missing list. 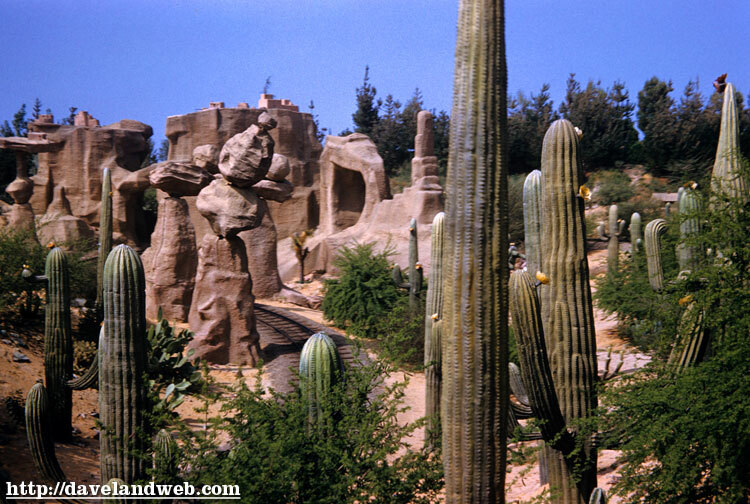 If it had been replaced with something better, that would be one thing, but in my opinion, Big Thunder Mountain is just another glorified roller coaster. 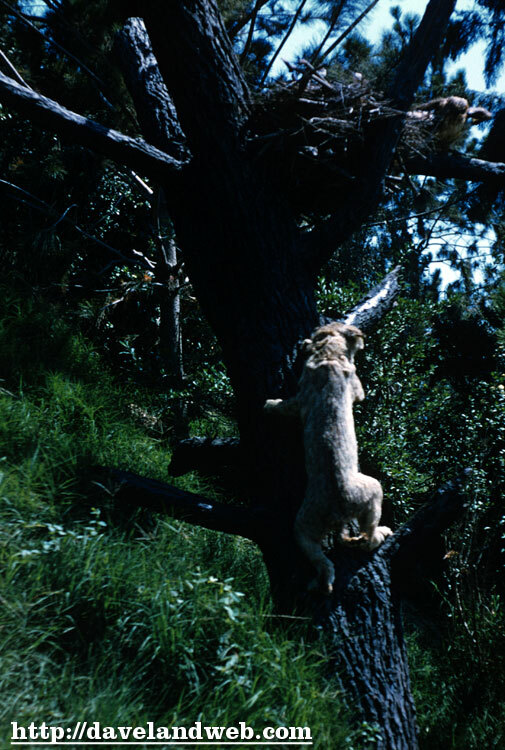 Back to the photos...the first three are from an undated batch, probably 1957/1958, and number four is from September, 1959. 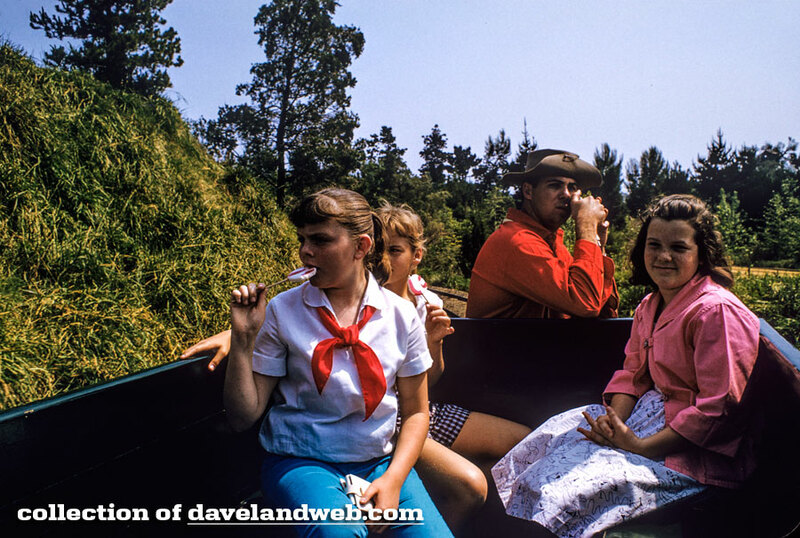 The last three photos are from May, 1958 (little girl, are you supposed to have that lollipop on this attraction?). 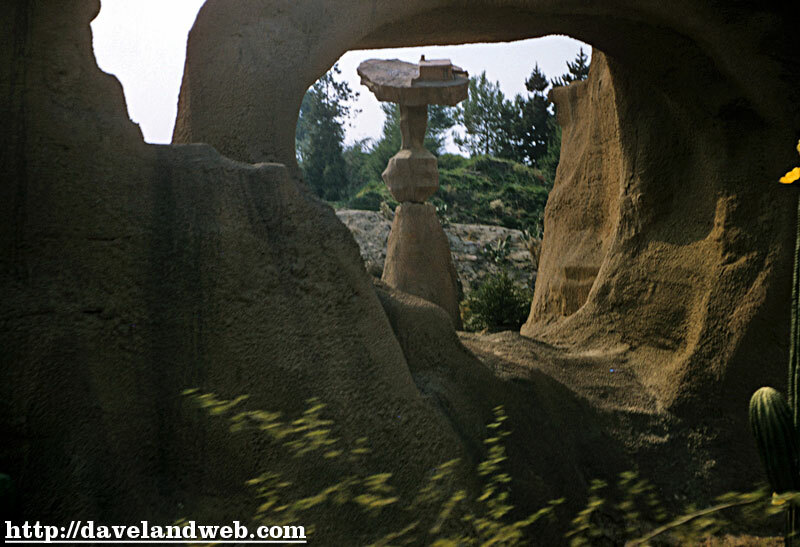 Here are a few from the Alice in Wonderland attraction; this posting was inspired by the Major’s recent posts. 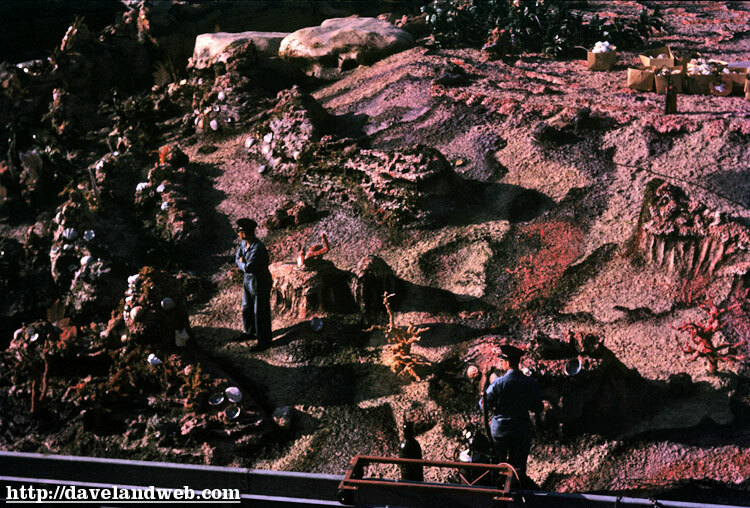 The first shot is from Oct. 1959. 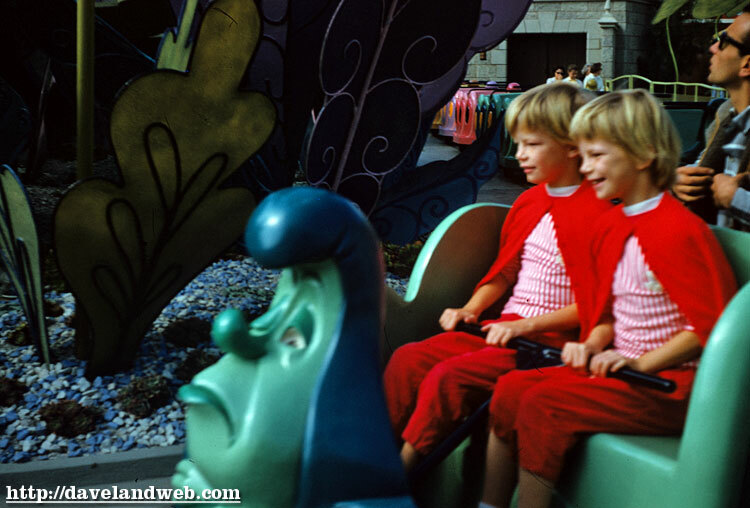 The other three are from February 1960, and feature two cute little blond girls in red sweaters. More pics to come of them later. And btw Major—if you find an extra Caterpillar vehicle after you get yours, let me know! 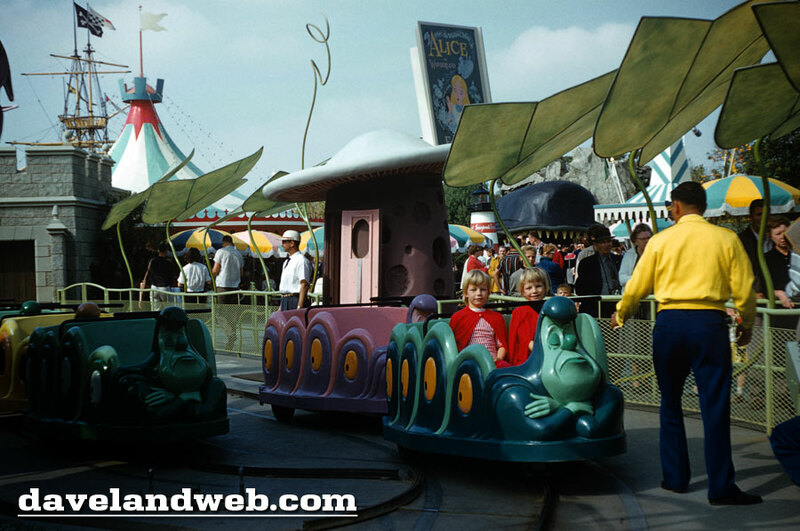 For more vintage & current Disneyland Fantasyland photos, visit my regular website. 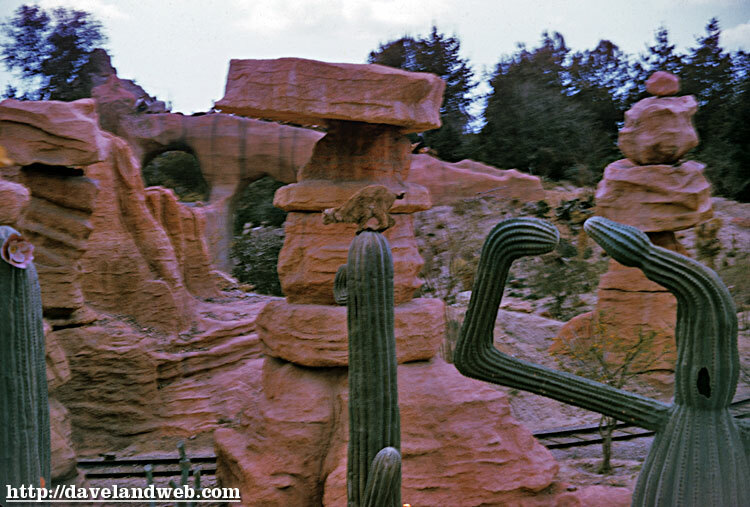 These slides probably would have never made it to this blog other than a detail I noticed last night as I was scanning them. 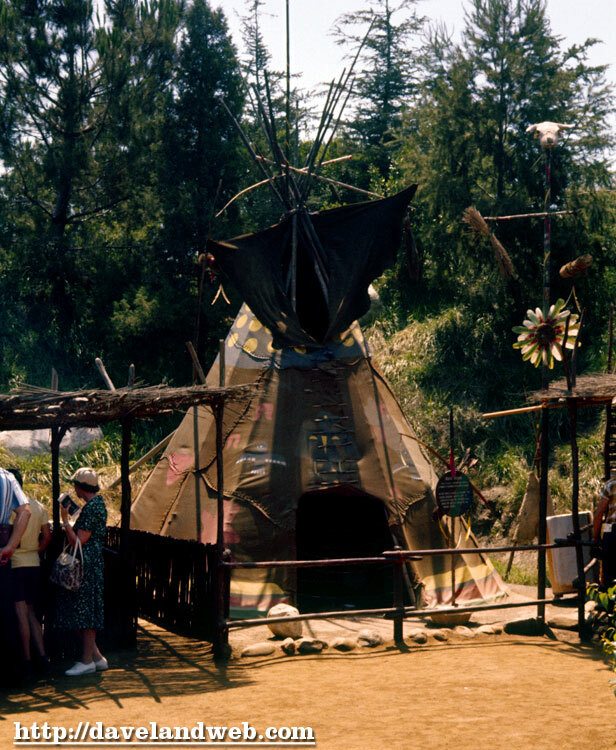 At first, when I scanned this slide from February 1960, I dismissed the structure at the top as some kind of teepee or shelter, but when I zoomed in, I could see a steel frame. I could hazard a guess (say, New Orleans Square/Pirates Building or The Haunted Mansion), but I’ll leave that up to the experts out there. 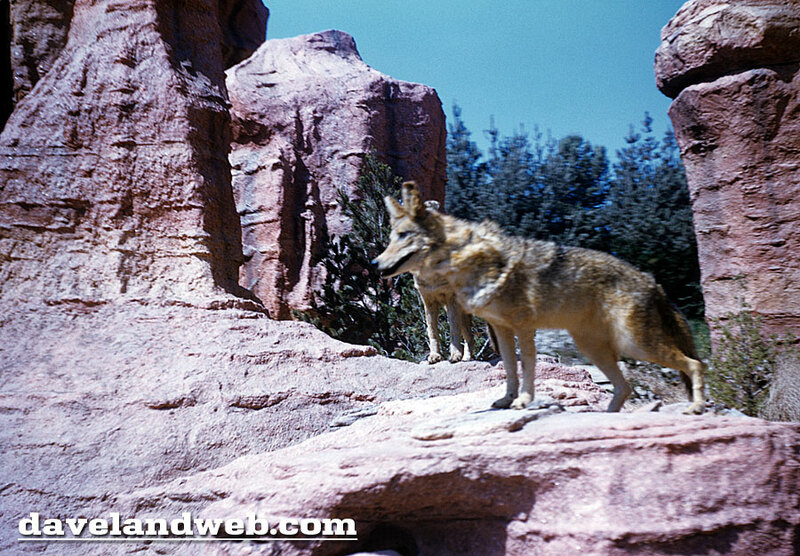 This slide is also from the same Feb. 1960 batch. 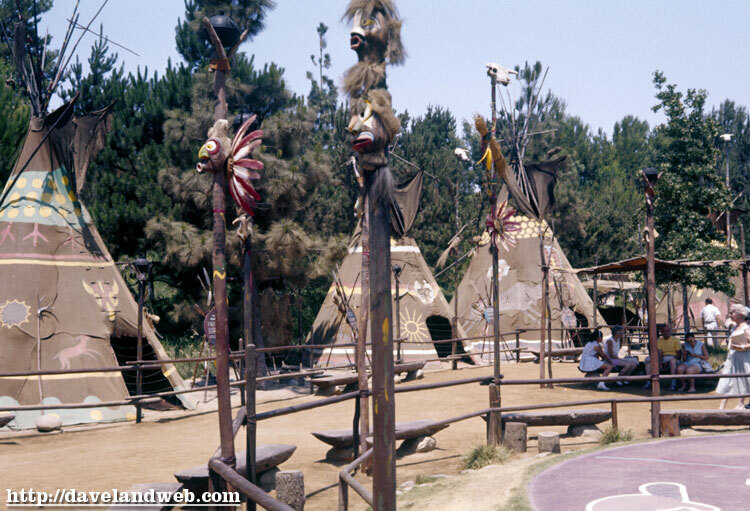 The next three are from July 1961, and show the legendary Indian Village, Teepees (complete with signage! 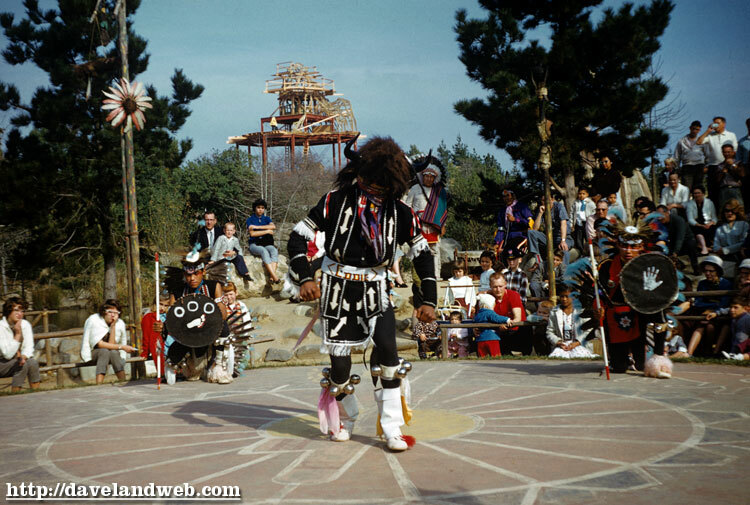 ), and the Ceremonial Dance Circle. 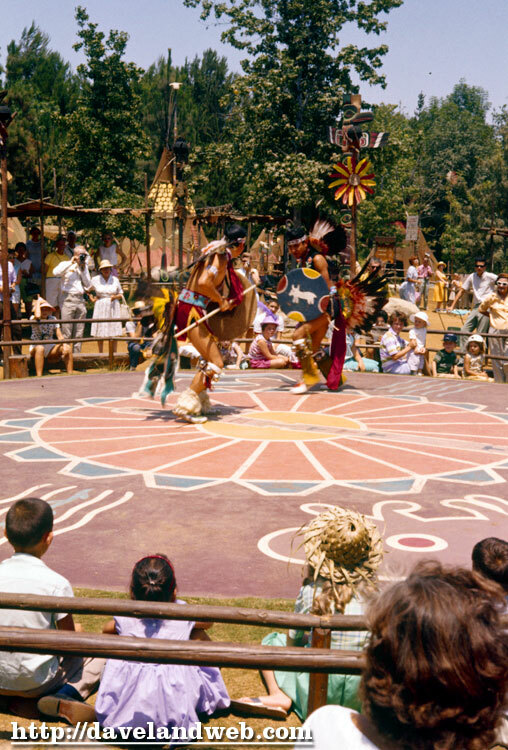 This last shot is from July 1968 and shows the “new” Indian Village complete with amphitheater that the Major mentioned recently on his blog. 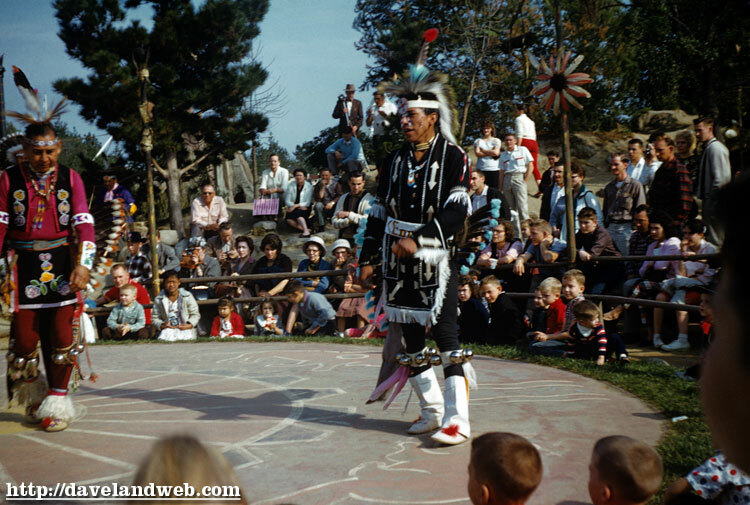 For more vintage & current Disneyland Indian Village photos, visit my regular website. 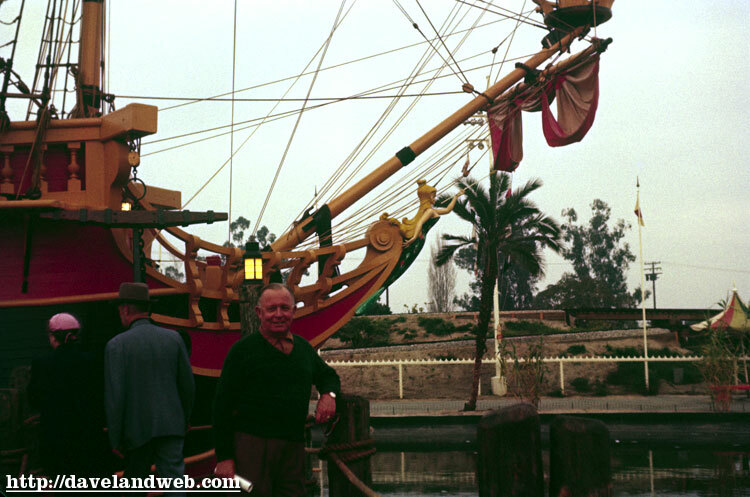 Today’s entry is an uninspired medley, starting with (what I have been told) a shot of the legendary Joe Fowler in front of the Chicken of the Sea Pirate Ship. For you afficianados of this boat, you can now purchase a model on amazon.com and create your own for only $9.95! 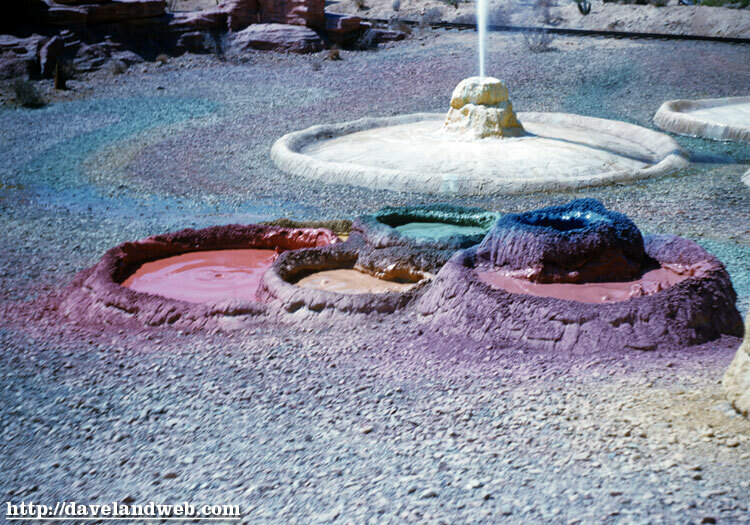 The colors Revell has selected are wrong, but with a few of my vintage pics as guides, you can’t go wrong. 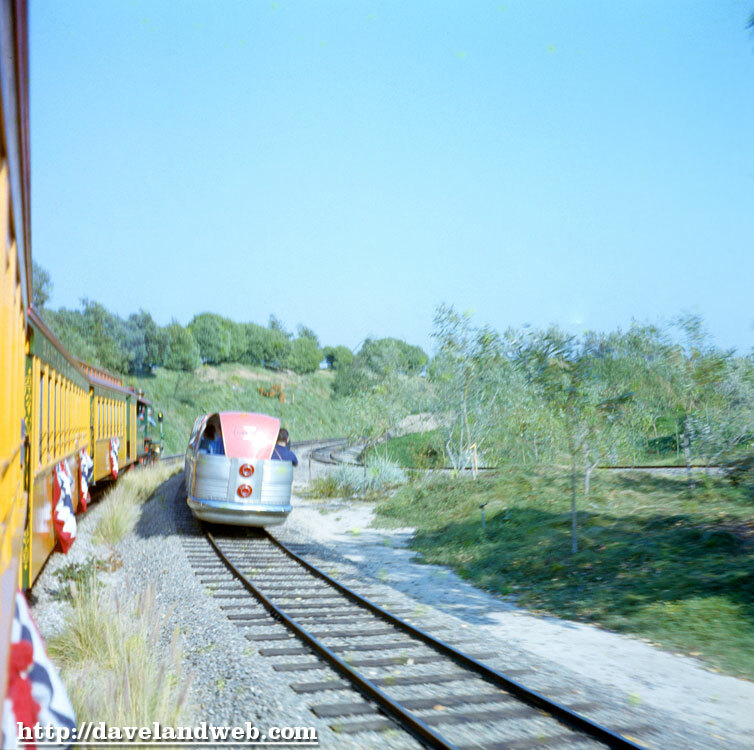 2nd photo today is a rear shot of the Viewliner, from an undated transparency. 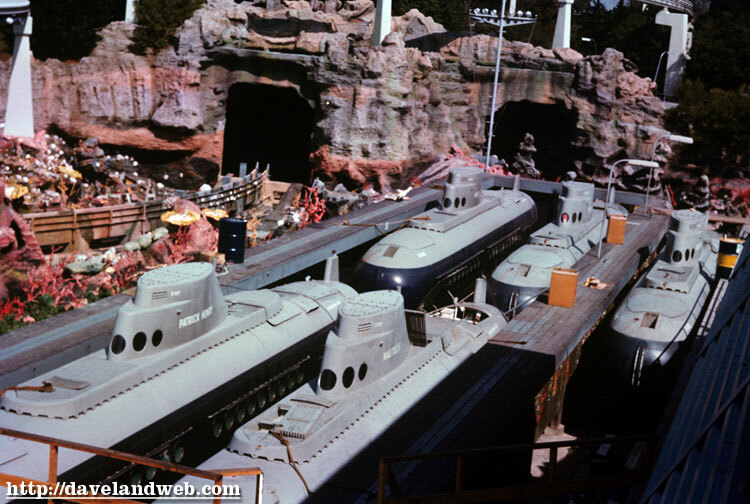 It always seems funny to see the DL Railroad side-by-side with this streamlined modern marvel! PLUG OF THE DAY: Please vote for my Haunted Mansion fanatic friend Brandon, as he attempts to win the Haunted Mansion contest. 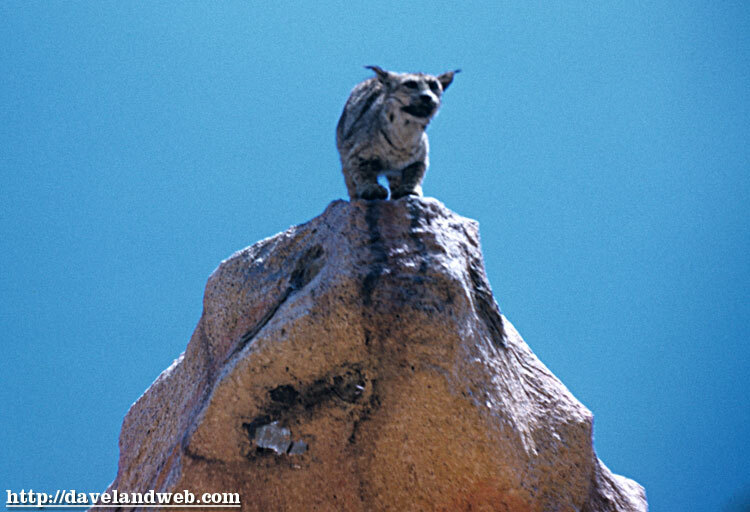 Just click here and vote!. And for the stellar news of the day, my brother has located his Polaroid pics taken on the same day as my Holy Grail post from Friday. Stay tuned for their posting! 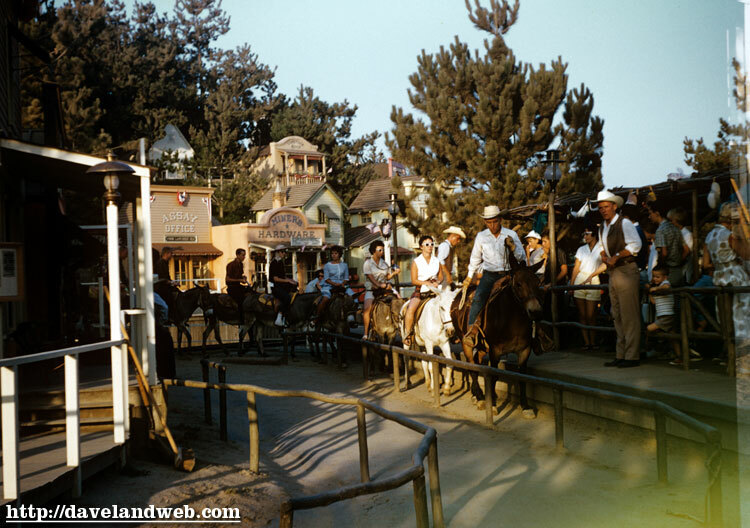 For more vintage & current Disneyland photos, visit my regular website. 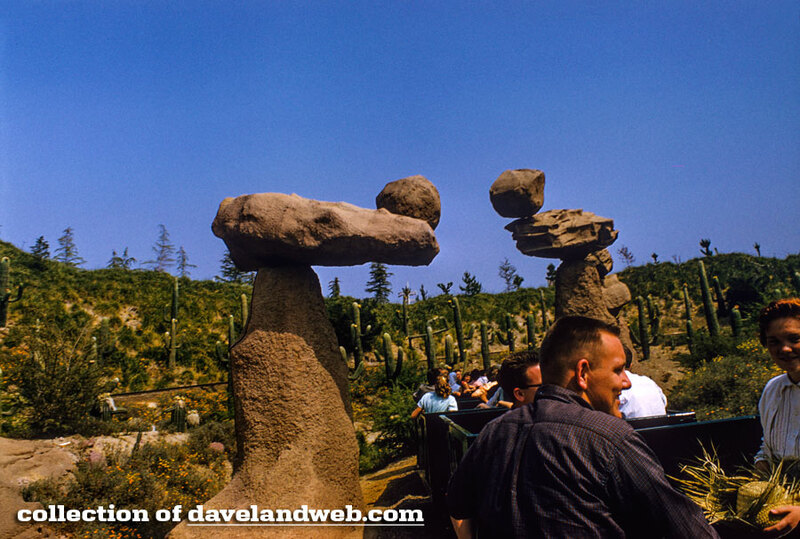 For me, the Disneyland Holy Grail was finding the negatives for my first trip to Disneyland on December 27, 1970. Although I couldn’t believe we only took 5 pictures that day, it was still cool to see the shots. 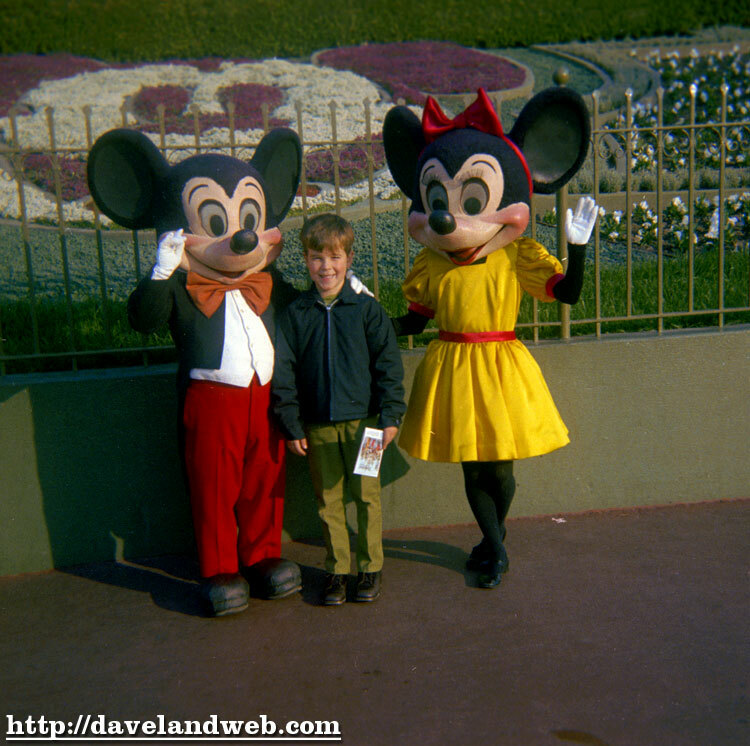 The first one is from the entrance area, I was able to pose with Mickey & Minnie. How often does that happen anymore without waiting an hour or more?!? 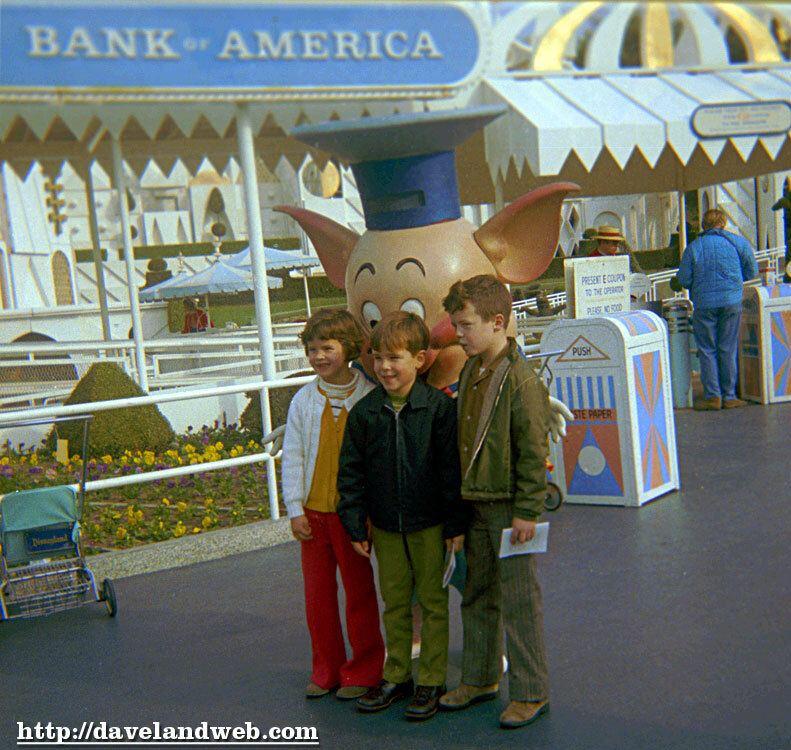 Picture two is me with my cousins near “Small World” with one of the Three Little Pigs. 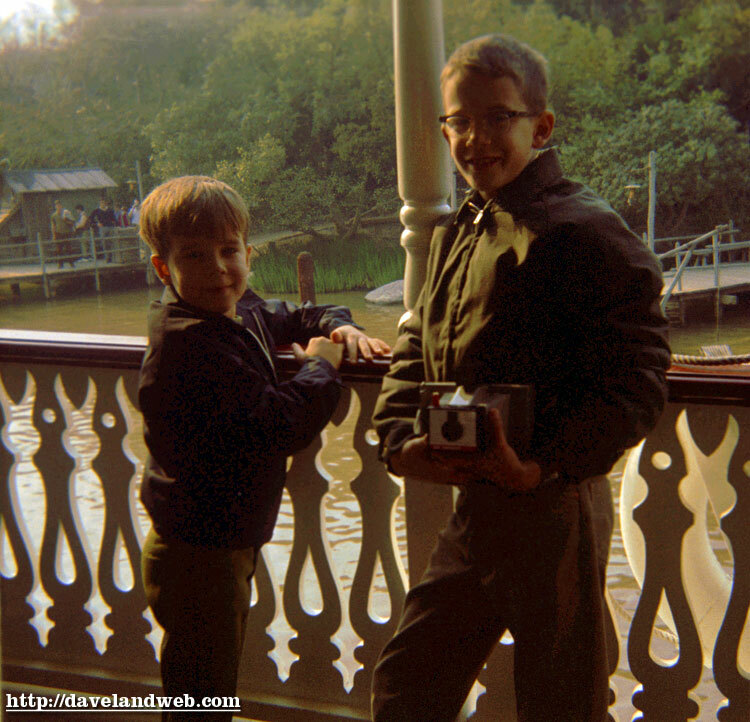 I still remember riding the Mark Twain and seeing the Burning Cabin; this shot is with my brother. 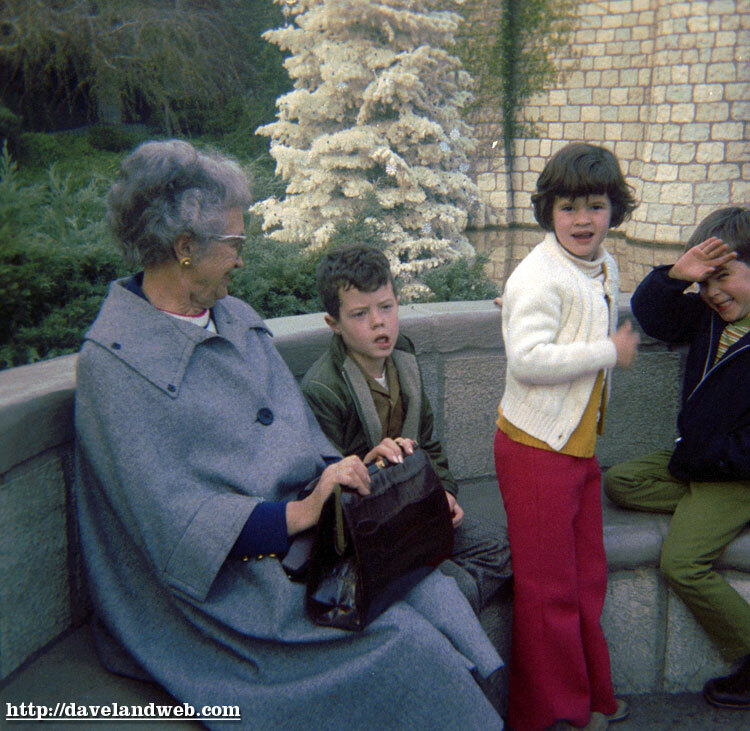 My grandmother & cousins sitting by the castle. Anybody who had an early Polaroid camera remembers having to find a trashcan to time the developing of the pictures, tear off the paper, throw it away, and then eventually “sealing” the photo with the protective coating stick. What a pain. 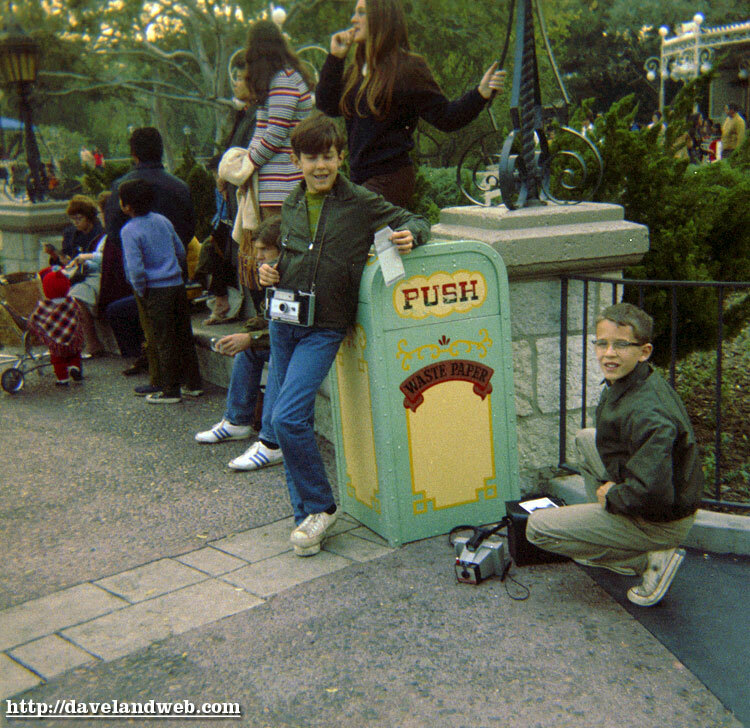 Here are my brothers doing just that near the Castle. I am hoping they can find the pictures they took!